A systematic retrospective review was performed, utilizing 9 years of data in the RFDS QLD electronic database (2004 – 2013). Coding for mental health as primary diagnosis and intubation were search criteria. A total of 1478 patients were transferred during the study period, with 44 requiring intubation. This equates to intubation rates of 3.5% prior to protocol utilization, compared to 2.3% following protocol implementation. In an Australian aeromedical service, implementation of a ketamine sedation protocol for management of the acutely agitated patient requiring air transfer has reduced the number of intubations in this patient group. The aeromedical transfer of psychiatric patients with acute agitation is a regular requirement in only a few countries, with ours (Australia) as one of them. Sedation of the agitated patient in the course of aeromedical transport is challenging due to the high degree of agitation that may exist, the large doses of sedative medications that may have been used prior to transport, and the risks involved if inadequate sedation is achieved during the flight. The optimal sedation strategy for the air transport of psychiatric patients remains unclear. At times, this has resulted in starkly divergent approaches taken by aeromedical providers ranging from use of physical restraints, or refusal to transport at all, to tracheal intubation and general anesthesia with chemical paralysis. Many patients with acute agitation can be transported safely using conventional benzodiazepine therapy. There is, however, a small subset of agitated patients who do not respond adequately to these first line sedating agents, and who require urgent air transport to progress their mental health care. In this situation, the resort to intubation and general anesthesia has often occurred despite its attendant risks. The Queensland section of the Royal Flying Doctor Service of Australia has a total of 7 operational bases for aeromedical missions that cover an area the size of 1,852,642 km² – a combined territory equivalent to three times the land area of France. A population density of 2.70/km² means that long distance aeromedical retrieval is often warranted. It is not uncommon for transfer times of up to 3 hours with Far North Queensland. Rural and remote communities rely upon the Flying Doctor for emergency and primary health care. When these remote sites have any residential health services at all, they are generally small community health centres staffed by remote-area nurses and visited by RFDS medical staff for several days each week. These clinics are not staffed after-hours, except for emergencies, and have no facilities to deal with acute presentations of major psychotic disorders. The exceptions are the small rural hospitals, which have several doctors and an after-hours ward, but no facilities for the acute mentally disturbed patient and no secure areas. As a result, even a single presentation of a psychotic or suicidal patient places great strain on the local resources, especially if they require constant restraint and supervision after-hours. Due to safety concerns, nationwide guidelines require transfer of all involuntary high-risk mental health patients to a facility with inpatient specialist mental health teams . Annually, an average of 161 patients with a primary mental health diagnosis require aeromedical transfer for acute assessment and management. Where a patient is so acutely unwell that they are deemed a risk to themselves or others such that they require inpatient medical care or locked ward supervision, they are clearly a serious in-flight risk to aeromedical staff and the safety of the aircraft. Any patient that is deemed a risk to themselves or others such that they require transfer to a psychiatric facility is not, by definition, safe for travelling on an aircraft. As noted previously, management of these patients has varied greatly, up to and including intubation and chemical paralysis. A recent meta-analysis has shown pre-hospital RSI is associated with first pass success rate of 90%. Unsuccessful endotracheal tube insertion can result in significant morbidity and mortality, such as esophageal intubation, hypoxia, and cardiac arrest. If a strategy avoiding resort to tracheal intubation could be implemented safely in the aeromedical setting, this could potentially improve overall patient care. After publication of a case series of 19 retrievals without adverse event, the protocol was rolled out across Queensland in 2010. Uptake was greatest in Cairns, Mount Isa and Charleville. These bases are manned by both RFDS medical and nursing staff. The other bases employ RFDS retrieval specialist nurses and outsource medical assistance to other retrieval companies such as Careflight. introduction of a ketamine sedation protocol for psychiatric patients requiring aeromedical transfer, (2) to compare the number of intubated patients between RFDS bases. A retrospective analysis of the RFDS Queensland electronic database was performed, utilizing statistical data involving primary diagnosis of a mental health condition and the use of intubation and ventilation during aeromedical retrieval. Classification of Diseases version 10, regardless of age, was included. The study timeframe covered a nine year period from Jan 2004 to December 2013, allowing for review of 3 years historical data, prior to and following introduction of the ketamine sedation protocol. Ethics approval for the study was granted by the Queensland Health Human Research Ethics Committee (Cairns, Queensland, Australia). Those patients transferred that did not include a primary mental health diagnosis were excluded; for example, those intubated due to post-hanging airway obstruction resultant from their suicide attempt secondary to schizophrenia. A total of 1472 mental health patients were transported during the specified time period, a mean of 163 per year. Of these, 44 required intubation, or 4.9 per year. The total number requiring intubation was 44 or 3%. (Cairns, Mt Isa & Charleville) vs those without such doctors (Brisbane, Townsville, Rockhampton & Bundaberg). In the latter case, flight doctors are provided by Careflight Medical Services, working with RFDS flight nurses and pilots. Cairns RFDS base implemented the Ketamine sedation protocol in 2007. It has consistently performed the highest number of psychiatric related aeromedical retrievals in Queensland, followed by the other bases. 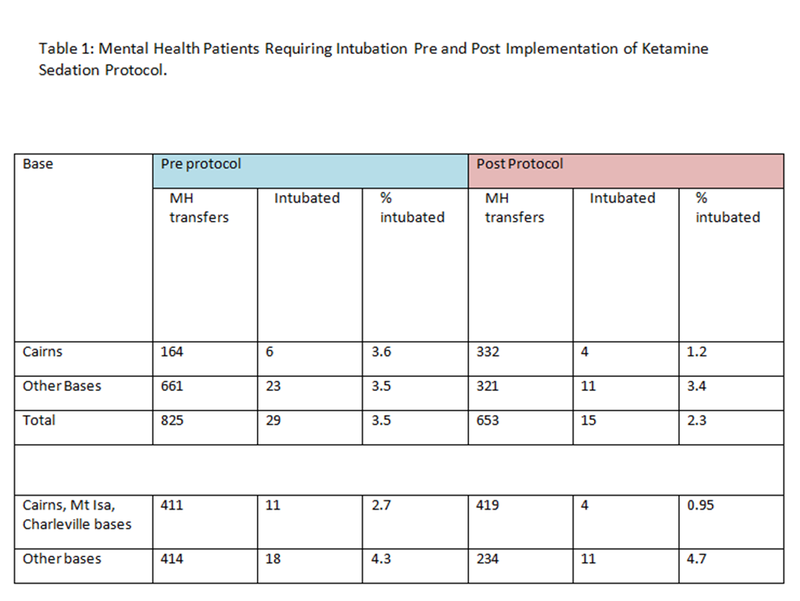 Table 1: Mental Health Patients Requiring Intubation Pre and Post Implementation of Ketamine Sedation Protocol. To our knowledge, this is the largest review of ketamine sedation and tracheal intubation in mental health aeromedical retrievals to date. Prior to implementation of the ketamine sedation protocol, the Cairns Base intubated 6 of 164 patients, and post 2007 (implementation), intubation for safe transfer was required in 4 of 332 retrievals, reflecting a reduction from 3.6 % to 1.2 %. This trend was noted in other bases staffed by RFDS doctors (Mount Isa, Charleville) after the 2010 rollout of the ketamine package. Cairns, Mount Isa and Charleville intubated 11 (or 2.7%) of 411 patients transferred pre- 2010. Post 2010, 419 patients were retrieved, with intubation rates reduced to 4 of 419 patients (or 0.95%). 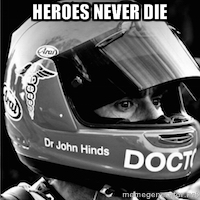 Intubation rates have not changed in the bases without any resident RFDS doctors. , 18 of 414 patients transferred (or 4.3%) pre-protocol were intubated, while post-protocol, this actually rose to 11 intubations in 234 patients (4.7%). These bases are staffed with flight doctors from Careflight Medical Services, and adoption of the ketamine protocol was the slowest to be implemented in these bases. The other significant aspect of this study is for the first time ever to our knowledge, a statistical benchmark key performance indicator for psychiatric aeromedical retrieval care can be extrapolated from this data. Tracheal intubation as a means of patient restraint has no known published data regarding the aeromedical setting, although it is a frequently utilized method anecdotally. The data suggests that a benchmark percentage of 5% of all aeromedical patients with a primary mental health diagnosis, be considered as the threshold for flagging inappropriate or excessive use of such a restrictive means of patient care. This study also suggests that it is feasible to achieve a performance of less than 3% reliance upon tracheal intubation, using a standardized ketamine sedation protocol. This electronic database required accurate coding of entries. It is possible that not all cases were coded correctly. We cannot establish causality from this type of study i.e. other reasons for reduction in intubation rates post protocol. For example, increased awareness and focus on improving sedation care may have resulted in higher rates of adequate preflight oral sedation, leading to reduced arousal prior to air transfer and hence reduced requirement for deep sedation and tracheal intubation. Ketamine sedation has been successfully implemented in a large aeromedical patient population, reducing the need for intubation by half in those managed by RFDS medical staff. Inter-hospital Emergency department transfer of acutely agitated patients using a ketamine sedation protocol should be considered. This study has demonstrated that in our setting, the implementation of clear guidelines and a protocol-based approach can reduce the number of intubations required for aeromedical retrieval of the acutely agitated mental health patient. This study has in part been funded by the Flying Doctor Retrieval Sedation Registry by RFDS QLD. ketamine. Nat Med. 2010 Dec;16(12):1384-5.
major depressive disorder. Ann Pharmacother. 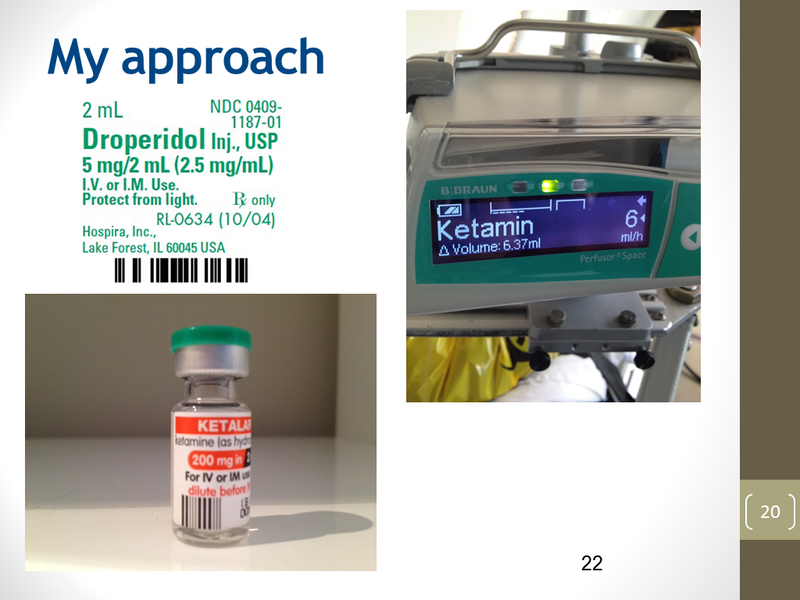 2012 Jan;46(1):117-23.
ketamine for analgesia and procedural sedation. Emerg Med J. 2009 Jan;26(1):62-4.
agitated patient. Air Med J. 2014 Mar-Apr;33(2):76-7.
rates of EMS providers. Crit Care. 2012 Feb 11;16(1):R24. paramedic rapid sequence intubation of severely head-injured patients. J Trauma. controlled trial. Ann Surg. 2010 Dec;252(6):959-65.
with acute agitation and psychiatric illness requiring aeromedical retrieval. Emerg Med J. 2012 Apr;29(4):335-7.